Another month has passed, and we’re still living in Paradise. 🙂 We’ve spent most of this time in the area around a bay called Bahia de los Angeles. The region is about 50 square miles, with the bay itself about a quarter that size. There are roughly a dozen islands nearby, ranging in size from big rocks to one that’s 7 miles long and has a volcanic cone at its head. There’s a small village in the main bay, and clusters of houses in a few other places, mostly gringo vacation homes. Since this is the hottest time of the year, most of those houses are vacant right now. The region is beautiful, with rugged hills along the Baja peninsula and clear turquoise waters, and the wildlife is abundant. 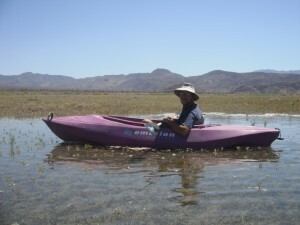 There are lots of places to hike, swim, kayak, snorkel, fish and enjoy other recreational opportunities. 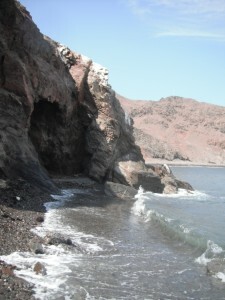 This area is just north of a group of large islands which stretch across the Sea of Cortez, in the narrowest portion of the Sea. This creates a pinch-point which restricts the flow of water during the tidal changes, creating more current than we’ve seen elsewhere in the Sea. This area also has rather high tide swings – as you may remember, we saw tides of roughly 20 feet in Puerto Penasco, among the largest tidal swings in the world. We encountered large tides and strong currents on our trip up to Alaska two years ago, so they are familiar and make for some additional interest and challenge in navigating. The numerous islands frequently funnel and redirect the wind in unexpected ways, and we’ve had some spectacular sailing up here. We’ve changed anchorages often, sometimes for practical or social reasons, but often because we are just enjoying the opportunity to sail! Both of us have learned a lot about sailing here, and we’re feeling more capable and relaxed than ever before. Dan even took an opportunity to sail solo one day (Kathy is flirting with the idea but is not quite ready for that challenge). Much of the region is home to whale sharks, and people are often comparing notes on when and where they were last sighted. There can be up to 8 or 10 at a time, although usually there are no more than 2 or 3. They gently cruise along at the surface, scooping up plankton into their huge mouths. Many of the people we’ve talked with have jumped in the water and swum with these dumb giants, but we haven’t yet had (or made!) that opportunity. We did encounter one while kayaking one morning, when it circled around a couple of times and went alongside Dan’s kayak and directly underneath Kathy’s! Apparently they bear live young (unusual for sharks), can live to 70 years, and leave no skeletons because they’re built of cartilage rather than bone. 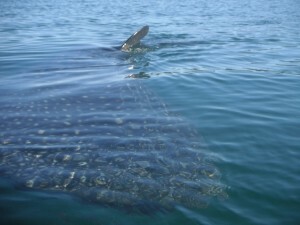 Any unusual ripple in the water can cause us draw in our breath and hope to spot a whale shark. There are also whales in the area, although not as many as we’d expected. We’ve sighted perhaps half a dozen in the last month. There are several types of whales that frequent these waters, but we haven’t learned to differentiate between them yet. Nonetheless, seeing a spout rise against the hills on the other side of a channel will always cause a moment of excitement, as we wait for a second one. 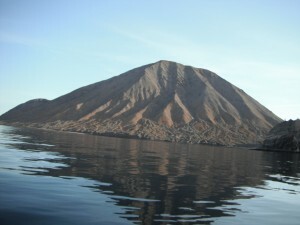 One anchorage that we enjoyed was right along a channel called the Canal de Ballenas (Channel of Whales), where we heard whales spouting throughout the night. Dolphins are fairly common here, usually traveling in large schools. Since these schools are feeding there is often a crowd of various birds overhead, typically boobies and pelicans, with an occasional gull. At times the dolphins appear to be celibrating life, because they leap out of the water, and occasionally add a flourish of their tails, making a loud slap. 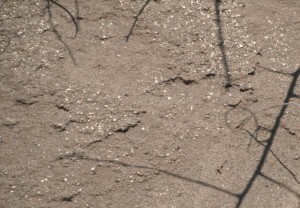 This area is home to lots of coyotes, and we often spot them on the shore. In some locations there is a wonderful chorus around sunset and sometimes later in the night. They seem to do quite well here, hunting birds and scavenging at low tide. 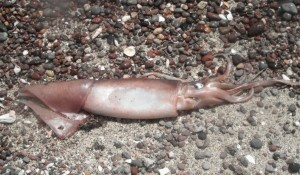 Early in the month, we saw a lot of squid washed up on the beach in the morning. Most of them had been visited by birds, but a few were still flopping around and we were able to help one back into the water where it quickly swam away. Although these were “only” about 30 inches in length, we think they were Humboldt squid, which are said to frequent these waters and can grow to 5 or 6 feet. Several times in the last week we’ve also had one or two turtles neaby, periodically popping up their heads for a breath of air before diving back below the surface again. At least one of them seems to have a pattern of surfacing three times in a row before disappearing for a longer period. 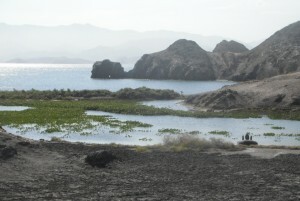 Our favorite place here was almost certainly Isla Coronado. For those who have a keen memory, there is another Isla Coronado in the southern Sea, which we visited several times last summer. Both have a volcano that poses an implicit – and irresistable – challenge. We hiked to the summit of both, for the spectacular views and for the athletic experience. The one here is 50% higher than the one further south, and the trail more direct and therefore steeper. It’s not for the faint of heart! We got an early start, to try to maximize our time in the cooler morning hours and minimize the time with the hot sun blasting down on us. 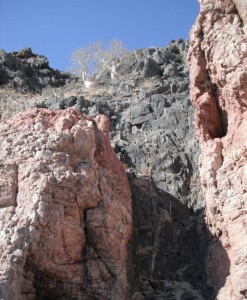 Even so, the rocks were uncomfortably hot to the touch when we were descending. The hike was difficult, but not insurmountable. We’d done a few “conditioning” hikes recently, and were well-prepared for this one. It took about 90 minutes to reach the top, and we spent about 30 minutes wandering around the summit. Although the caldera isn’t very pronounced, we walked around the rim. We flushed out a large iguana, but otherwise mostly enjoyed the view of the neighboring islands. Coming down we were drawn by the beautiful sight of the cool waters of the bay where we’d stashed our dinghy. As it approaches the full moon (and also the new moon), the tides get higher (and lower). In places like this, they provide an opportunity that is not used as frequently as in times past. 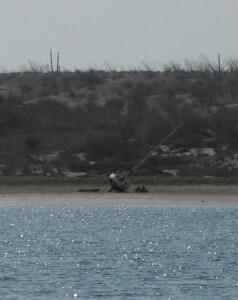 Boaters can intentionally bring their boats up on the beach, grounding them on the outgoing tide, so they can work on the hull. This is called “careening” the boat. Two of the boaters in the area did this shortly before the August full moon, and caused a bit of a stir in the process. Both of these boaters were sailing alone and knew their boats inside-out. They each chose to do this because they are independent people who didn’t want to go to a boatyard and pay to have the boat hauled out for a relatively minor issue, but one which needed to be attended to sooner rather than later (one needed to paint the bottom, the other had a leak that needed to be investigated). Although neither of them wanted much attention, word got out and there were 9 boats in the “best” anchorage at the time. Everything came out well for both of them. and it was interesting for us to see the thought process that they used in choosing when and where to careen their boat, how they positioned the boat, and the precautions they took before, during and afterwards. Although we did not careen our boat, we learned a lot about the process, and are more capable of doing it with Lungta should we ever need to. We’ve been enjoying sleeping outside on the deck recently. There have been lots of shooting stars in the night sky. In early August is the annual Perseid meteor shower, which this year fell during a period with a nearly new moon. This means that the sky was quite dark when we were awake and watching. For whatever reason, there have been few shooting stars that we’ve both seen, but we’ve both seen quite a few this year, some of them with quite spectacular long tails. We’ve also enjoyed a few nights with lightening shows on the horizon. Even nighttime in paradise is wondrous! The weather has been lovely, but is just now starting to change. As the water in the Sea warms up into the 80’s, the tropical storms forming in the lower latitudes are starting to become more likely to head up into this area. So far we’ve only seen the decaying remnants of these storms, in the form of clouds and some gusty winds. As many of you may know, the tropical storms that exceed gale force winds are given a name, with the names chosen from an alphabetical list, starting at ‘A’ each season. 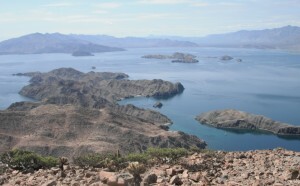 Historically the ‘J’ storm has often been a rough one for the Baja peninsula and the Sea of Cortez. There were some nervous comments and nail-biting this last week, as we waited to see what “Juliette” held in store, but it has come and gone, leaving a wet mass of clouds behind as it headed out west into the Pacific Ocean. Last year this series of storms began coming into the Sea earlier than this year, and the peninsula greened up in relief after a few years of no rain at all. We’ve had two days with rain so far, and are looking forward to seeing the green re-emerge. September is typically a turbulent month for weather in the Sea. We’re staying up-to-date with the weather forecasts via our ham radio, and always have a safety plan in case a hurricane heads our way.